PHP Scripts Mall experts have developed the effortless restaurant table and food ordering app with mobile-friendly, phone order outstripped system, nowadays the food ordering business system has become the trendsetter in getting more revenues with less effort and less investment, so the restaurant owners and new entrepreneurs are well started their business on the online marketing. Today, the majority of the restaurants are making use of the online food ordering systems that ensure its users to have a better and convenient way of ordering their cuisines and getting revenues on developing their own restaurant site and app. 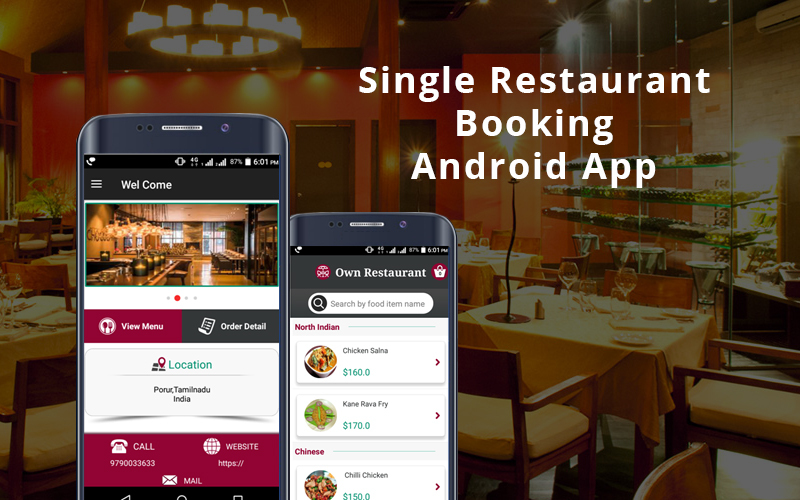 Based on this demand we have developed the Online Food Ordering Android App with easy booking and managing food and table booking management system. The Table Booking App is made with appreciated user recommended friendly booking customization. So this app will sure take your business to the next level online booking with easy managing and friendly mobile UI. Here the users can register their account with their individual mail id and password after the account gets confirmed the users can log in to the app and can find the home with restaurant portal menus and details with the network connections. The users can search the food order in the home page by entering the keyword or the product food item name in the search box where they get accurate user response. The Food Ordering App has benefits to the preferences of the modern consumers where they can order the food items by seeing the details and product images of the food items. The products are added to the cart and they can order the favorite food recipe from their favorite restaurant. To make flexible for the user booking we have integrated the food cancellation functionality in the app with a mobile-friendly compactable app. In the Online Food Ordering Android App, the admin can easily manage and optimize the app. The admin can manage all the categories and also can able to see the total number of home delivery orders, table booking and the total number of order management in the dashboard. It is easy for the users to share and rate the app for the restaurant service providers. It is easy for the users to monitor and locate the location of the restaurant by using the Google Map. We are sure that our precise Food Ordering App will enable you to accomplish incredible online food delivery app.